Apple Watch is pretty awesome at doing a lot of things. But mapping workouts isn’t one of them. At least, not until now. Back in 2016, I was pretty disappointed with the maps I got from my Apple Watch Series 2 (the first model that came with built-in GPS). When I tested it at my local running track, the maps it generated looked like random scribbles. Fast-forward to today, and things look a whole lot better. Last week, I repeated that test with a shiny new Apple Watch Series 4 and got some very interesting results. GPS calculates your position by measuring tiny differences in how long radio signals take to reach your location from multiple satellites orbiting more than 12,000 miles above you. The speed these satellites travel at means that, thanks to relativity, time actually passes slower for them than it does for us here on Earth. The clocks on these satellites compensate for that. But it’s still pretty remarkable that GPS works at all, when you think about it. 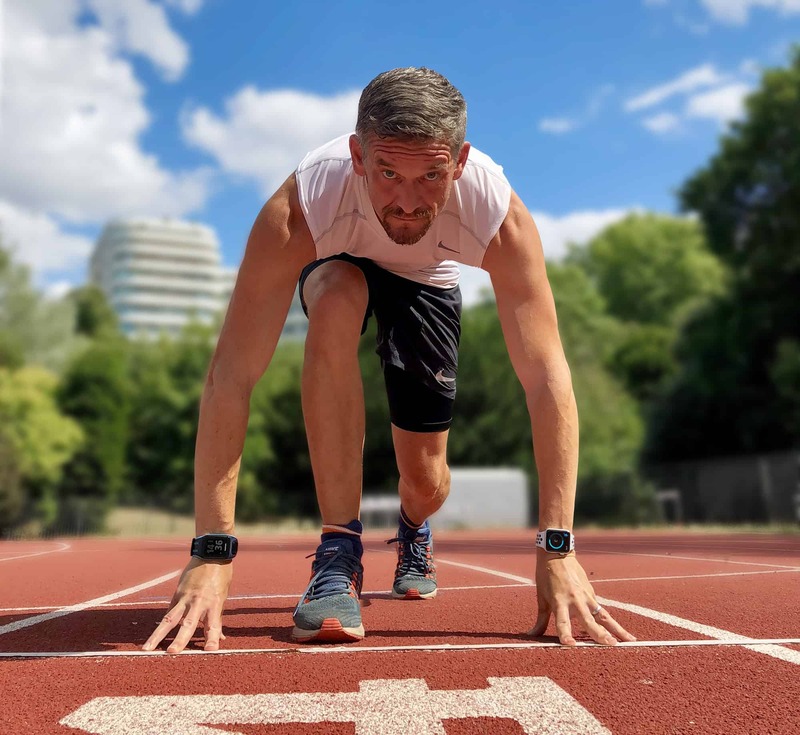 To improve accuracy, running watches supplement GPS data with motion sensors, like the Apple Watch’s built-in gyroscope and accelerometer. That’s why different watches will give you slightly different pace and distance estimates. For runners, this is one of the first things you notice when you buy a new running watch. Running the same route can generate noticeably different estimates with different hardware. When you upgrade your watch, you might discover you haven’t been going quite as far or as fast as you thought. When Apple Watch Series 2 was first released, a lot of reviewers focused on these differences. Apple Watch often gave distance estimates that were strikingly different from what reviewers were used to seeing. So much so that some reviewers concluded it was less accurate than competing devices. But was it really? Maybe Apple Watch estimates were different because they were in fact more accurate, not less. To find out, I wanted to take my Apple Watch for a run for a distance that I knew had been independently and accurately measured. So I headed to my local running track, in Battersea Park, which happens to be just next to Apple’s planned UK campus in the newly redeveloped Battersea Power Station. One loop of this Olympic-size track measures exactly 400 meters. So 2.5 laps is 1 kilometer. To reduce the chance of getting a fluke result, I did six separate 1-kilometer runs, at a pace of around 4 minutes per kilometer. I wore an Apple Watch on my left wrist and my previous running watch (a TomTom Runner 2) on my right. During the tests, I kept my iPhone turned off and left it in my locker, to make sure that my Apple Watch was only using its built-in GPS. Get set for some surprising results. The most striking thing about my original Apple Watch Series 2 test results was just how bad the route maps were. They looked massively inferior to the precise mapping I got from my previous running watch. The difference was so extreme that I could understand why some reviewers questioned the Apple Watch’s accuracy. But when I looked at the actual distance estimates, a different picture emerged. In this respect at least, Apple Watch Series 2 was in fact significantly more accurate, despite the terrible maps. Apple Watch Series 2 couldn’t keep up with TomTom when route mapping the running track. Every year since then, I’ve bought a new Apple Watch and taken it back to the track, hoping to see some accuracy improvements. And sure enough, I have. As you can see from the results below, with each new Apple Watch model I tested, the maps became progressively more accurate. The latest Series 4 results I got last week prove pretty much indistinguishable from those I got from my trusty old TomTom. 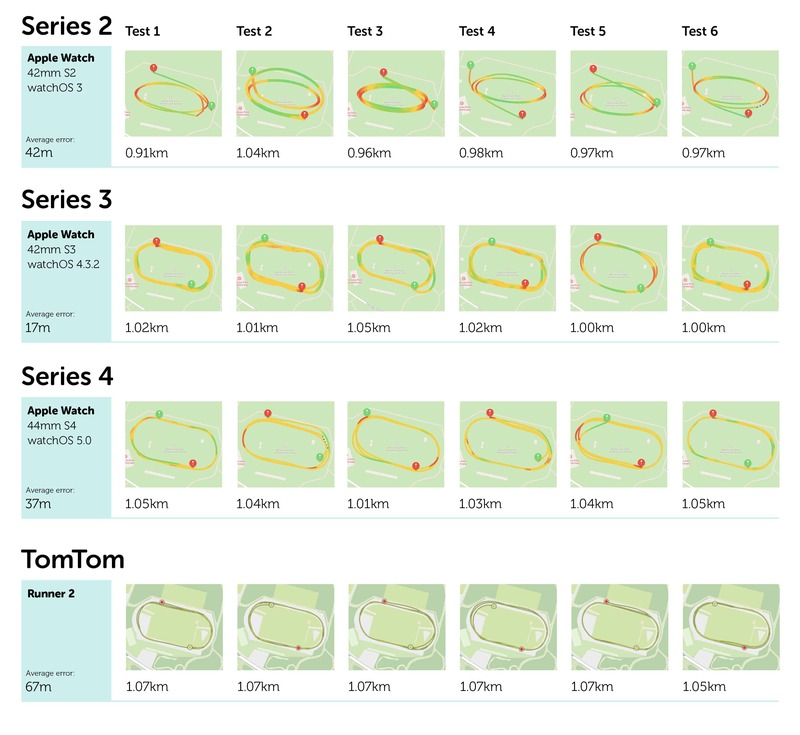 The results are in: Series 2, 3 and 4 running accuracy compared. Are we seeing improvements in hardware or software? The new ceramic back of Apple Watch Series 4 is designed to improve cellular reception. I was wondering if this might also help with GPS reception. But since the distance estimates between Series 3 and 4 are essentially the same, that does not appear to be the case. Apple has improved the rendering of its workout maps over the years with each update to watchOS, so the mapping improvements probably have more to do with software rather than GPS reception. That’s great news for anyone owning an older model that’s upgraded to watchOS 5. Even if you don’t upgrade to the latest hardware, your Apple Watch should produce better maps these days. I believe these track tests provide a pretty reliable guide to the accuracy of each generation of Apple Watch. But there are limits. Real-world running conditions are often very different. The track I use is surrounded by parkland, far away from tall buildings and trees. So the GPS reception is good. But in reality, most of us don’t go to the running track every day. We run through streets surrounded by tall buildings, or in parks under tree branches. These environments interfere with GPS signals, and some running watches are better at handling it than others. From my anecdotal experience, Apple Watch’s mapping is more susceptible to GPS signal attenuation than some other running watches I have tested. I’ll be looking out for improvements in my new Series 4 as I run with it over the next few weeks — especially when I’m in big cities with tall buildings. Cupertino is always improving its products. The company never rests on its laurels. The original iPhone, for example, was a visionary product. However, it lacked a lot of essential features, like high-speed data and an App Store. It was only when iPhone 3G was released that Apple’s smartphone really achieved its full potential. The same is true of Apple Watch. The original model showed loads of potential, but some important omissions (like the lack of built-in GPS) held it back. Apple has been hard at work ever since. Apple Watch Series 2, 3 and 4 each brought massive hardware improvements, like the addition of GPS, LTE, waterproofing and a bigger, bright screen. The software has also leaped ahead, with indispensable features like heart rate recovery, heart rate variability and target pace. 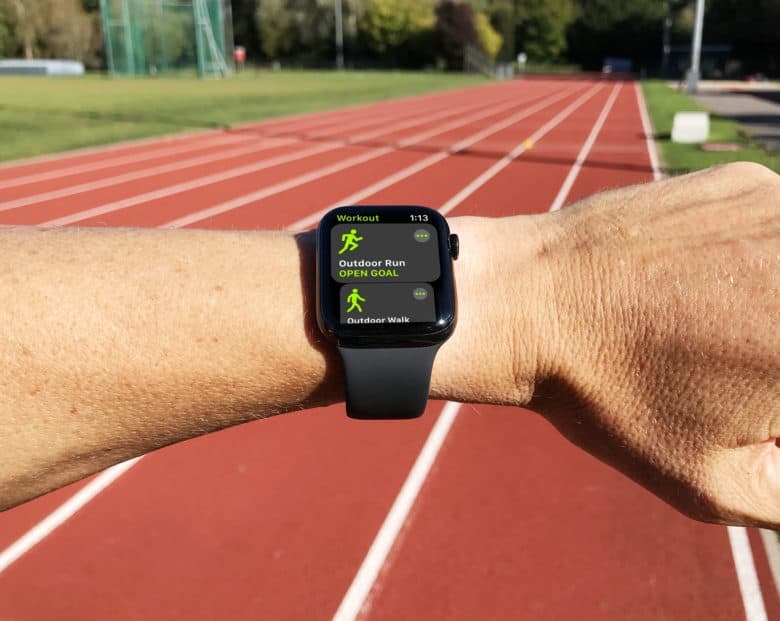 But for my money, these latest improvements to workout maps are the final missing ingredient in making Apple Watch a great choice for runners. I now feel confident recommending Apple Watch to all my running buddies.